To some, having a product manager in a newsroom seems unusual. After all, the news isn’t a product. And surely the readers of the news don’t consume it in the same way they consume retail products — right? With the overwhelming amount of technology at our disposal nowadays, both the news and how we engage with it are ever-changing. As a result, there’s more of a demand on news organizations to find new ways to drive revenue, increase readership — and you know, report the news. That’s where product managers come in — to work with newsrooms and journalists to navigate this constantly changing landscape. What is a product manager, anyway? Generally speaking, product managers help to plan and implement the vision and strategy of a company’s products. For newsrooms, “products” could be anything from newsletters and membership services to the actual technology journalists use to tell news stories. Since products themselves exist on a broad spectrum, it’s easy to understand why product managers’ responsibilities also are vast and varied. “Product managers are responsible for overseeing a news product that is both an editorial success, a commercial success, and is built efficiently and functions well,” writes Jeff Sonderman from the American Press Institute. What does project management look like? The easiest way to understand how product management and news organizations work together is to look at some of their projects. Over at Building The Atlantic — a blog that’s home to designers, product managers, and web developers at The Atlantic — DJ Brinkerhoff writes about the strategy that went into creating their new article page. A whole post devoted to an article page — something so simple, yet so important. A place where audiences directly interact with journalism and technology. Anika Gupta, senior product manager at The Atlantic, writes about another product: membership programs. In this post, she focuses on journalism and technology, but she also emphasizes a strong focus on audience and building a community. 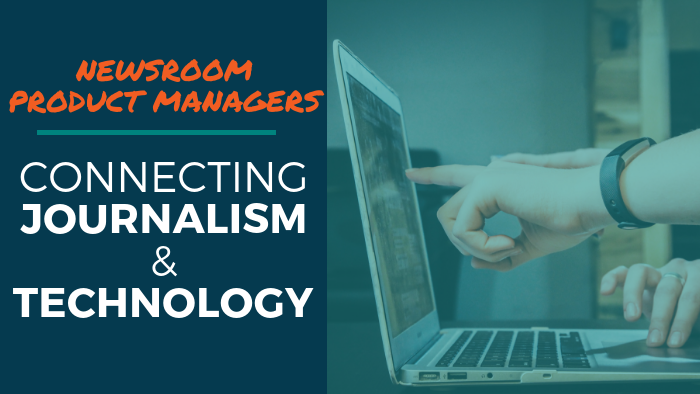 Product managers help to fill the gap between not only technology and journalism, but also the news and its readers. Tech knowledge isn’t all that’s required though. “In a journalism organization, there has to be attention to journalistic ethics and sensibilities built into digital products,” said Cindy Royal in an interview with Global Investigative Journalism Network. In other words, if product management adopts the news as a product, that product still needs to hold up against journalism best practices and ethics. Overall, it makes sense why product management positions keep popping up in media and news organizations. Someone has to help news organizations implement technology in a way that preserves the journalism, and ultimately reaches audiences in a valuable and meaningful way. Like I said before, it’s complicated — but for news organizations struggling to do it all — a product manager may be a worthwhile investment.